Antiques are experiencing a new boom in popularity, and the demand for antique furniture is increasing as people turn to retro-inspired styles when decorating their homes. Here are 9 reasons why antiques are 2018's biggest trend. Gone are the days of uniformity and keeping up with the newest trend: 21st century people seek individuality and a personalised style over mass-produced items, which makes antiques an ideal choice due to their uniqueness. Antiques are often handmade and dificult to find in their original condition, making them exude a unique feel that is difficult to fake. Unlike fast-depreciating modern furniture which becomes difficult to resell as time passes, antiques are prized as good investment items as they retain their value, sometimes even increasing in value due to the cyclical nature of market trends. This means that buying accessories or furniture for your home could earn you a few pounds! Antique items are typically handmade by a specialised artisan who puts hours of labour and care into the manufacturing of a single piece, as opposed to being made in a factory in a matter of minutes. The process that goes into their creation makes them high-quality and able to last for generations when cared for properly. Antiques do not just look good in a full-on “retro-style” environment, but can also be included as a statement piece in a modern one. Mixing and matching allows you to integrate old and new elements, creating a patchwork of eras and styles that will instantly become “yours”, giving a house (or pub/restaurant) interior a truly personal touch. 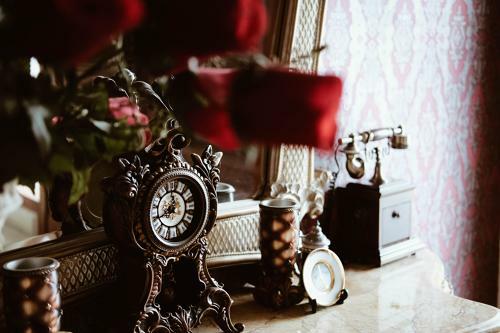 If the first thing that comes to your mind when you think “antiques” is 200-year-old wardrobes, think again: many antique specialists now consider the definition of “antique” to include items from the early 20th century, sometimes up to the 1950s! This gives you a wider choice when it comes to style, allowing you to pair together pieces from different times such as a 1920s haberdashery cabinet with an 1800s chest of drawers. In this day and age, the practical aspect of household objects often takes priority over aesthetic, which can be a disappointment for those of us who value detail and beauty even in everyday items. In contrast to the minimalist trends of today’s furniture, antiques are often highly detailed, with features such as carved-in motifs and patterns that will capture the eye of anyone with a keen eye for detail. As Generation X and older millennials have grown up, their disposable income has also increased, renewing the interest in antique furniture which is now experiencing a comeback. The world of antiques is evolving and adapting itself to the modern buyer’s interest. The world of antiques might be adapting to modern tastes, but at the same time it represents an element of familiarity which many buyers turn to in our uncertain times - when society is experiencing change, people tend to crave security, turning to the style of furniture that takes them back to a simpler time. The antiques trade does not just involve furniture: if you already have furniture in your home but you are still looking to add a retro, edgier style without replacing any of it, you can turn to other vintage collectible items such as ceramic dolls, that you can display in your home, which are guaranteed to impress guests. The trend for buying retro has also extended itself to personal, wearable items such as antique engagement rings, which have experienced a revival in the past decade. If you want to see a range of antiques, antique furtniture and shopfittings, you're always welcome at D&A Binders in Holloway, London. Not only will we make you feel at home, we'll show you the best in Antiques and explain why we love doing what we do.